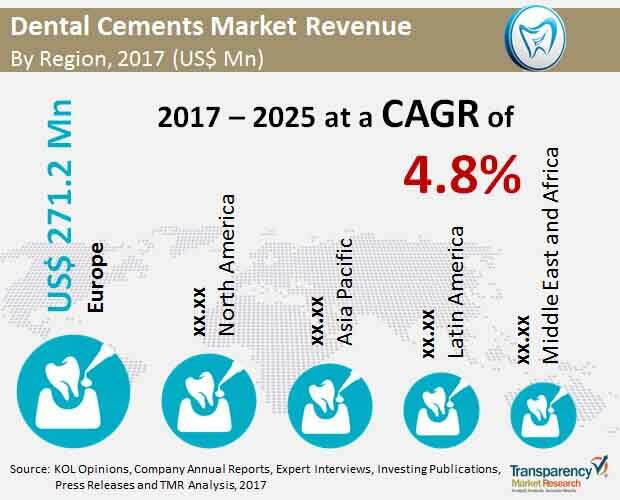 The global dental cement drugs market was valued at approximately US$ 785.4 Mn in 2016 is projected to register cumulative annual growth rate (CAGR) of over 4.8% from 2017 to 2025, according to a new report published by Transparency Market Research (TMR) titled “Dental Cement Market – Global Industry Analysis, Size, Share, Growth, Trends, and Forecast, 2017–2025”. The report suggests that surge in rising number of dental caries, aesthetic look and dental medical tourism are important factors responsible for the growth of the market in the coming years (2017 to 2025). As key players introduce their advanced dental cements in developed markets such a North America and Western Europe, these regions are likely to account for dominating share of the global dental cement market. Changing dietary habits and medical tourism in emerging markets such as China and India is likely to boost growth of Asia Pacific dental cement market at a CAGR of around 5.4% from 2017 to 2025. The cost of dental procedures such as dental implants is very high, making them unaffordable for many patients. According to a report published by UBS (Universal Bank in Switzerland), in 2016, the penetration of dental implants in the U.S. was still below 15% of tooth restorations. Many patients cannot afford dental implants, which can cost US$ 3,500 for a single tooth replacement and up to US$ 10,000 for a full denture in the U.S., and instead receive traditional treatment. According to an article published on Health-Tourism.com, the cost of dental implant for six teeth in U.S. clinics is US$ 18,500 whereas it costs only US$ 3,600 in Mexico and dental implant for one teeth costs around US$ 2,000 to US$ 10,000 in the U.S. and the same procedures costs US$ 1,000 in Mexico.. With rising cost of dental procedures individuals delay their dental procedures and these factors there by restraining growth of global dental cement market. The report offers detailed segmentation of global dental cement market based on product type, material type and end users. Among the product class, permanent dental segment is poised to account for leading share of the global market during the forecast period from 2017 to 2025. The rising number of cosmetic dental surgeries has accelerated the growth of permanent dental cements. Also, with increasing geriatric population there is a need for artificial casts. All the factors would accelerate the growth of the permanent segment. The permanent dental cement is anticipated to grow at a CAGR of 5.1% during the forecast period. The slow growth of temporary cement is characterized by increasing number of cosmetic dentistry across the globe. The use of temporary dental cements in cases of immediate restoration will also drive the growth of the segment. By material type the glass ionomers segment is expected grow at a CAGR 5.7% during forecast period and hence dominates the global dental cement market by material type. The growth of the segment is attributed with the increasing growth of the hybrid or resin modified glass ionomers cement. Glass ionomers cement is an acid – soluble calcium and has fluoride in it which inhibits recurrent decay. The cement causes less trauma or shock as compared to other cements. However, the slow growth of the segment is due to few of its disadvantages such as type I & II cements are used in restoration of primary dentition. Polycarboxylate dental cement is the less contributing segment for the growth of the global dental cement market and the segment is expected to grow with a CAGR of 4.1% during the forecast. The report also provide profiles of leading players operating in global cardiovascular drugs market include 3M, Danaher Corporation, Dentsply Sirona, Ivoclar Vivadent AG, SHOFU Dental GmbH, BISCO, Inc., SDI Limited, DMG Chemisch-Pharmazeutische Fabrik GmbH, FGM Produtos Odontológicos, Medental International, Inc.. Expansion of dental cement portfolio through improving existing product portfolio along with continuous innovation in the dental restorative material.